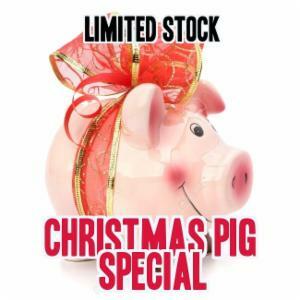 £ Christmas Pig Special - Limited Stock!!! Why not do something different this Christmas and treat your family and friends to a bbq / spit roasted pig? Imagine cooking your own pig over hot coals, dripping fat sizzling in the flames, the crackling turning crispy. The feast to be shared. Glass of wine or cold beer in hand. Well you can if you act fast - our last kill date before Christmas is December 18th. After this time we can supply your pig in the new year. You can even book one of our hire machines or spit to roast your pig. Or perhaps you'd prefer your special pig as two sides of pork? Just select this option from the drop down menu before paying. SAUSAGES!!! The final option from the drop down list is we'll turn your pig into some awesome sausages! Breakfast, Lincolnshire, Old English and Cumberland. Buy your pig now by clicking on the link below! Stock is strictly limited on a first come basis. This special is for collection, though delivery may be available, please let us know your requirements. Spit loan and hog roast machine hire is subject to availability and a deposit. Sausages - you may choose the seasoning, minimum 3 kgs per seasoning.